The ancient parish, like the present parish, though little more than a mile in width was seven miles long. At the extremities the land was poor, but in the centre it was good and there was an unfailing supply of water. It was in the midst of this good land that the ancient village stood; and it was in the midst of the village that the earliest church arose. Erected on a slight eminence, it looked down upon a tiny pool fed by the waters of perennial springs. 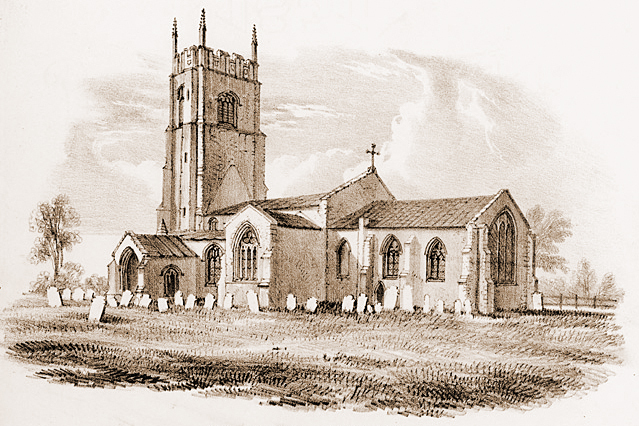 St. Botolph's Church, Grimston Robert Ladbrooke 1800's. North of the tower in the West wall of the Church can be found a few carrstones arranged in "long and short work" style, possibly the only visible part of the Saxon building, the corner of the Church, before aisles were added on each side. Looking back towards the tower you can see where the roof was pitched at different times. If you look you may also find a very ancient anvil to mark a blacksmith's grave in the churchyard. Early in the 13th century it was decided to enlarge the small church then existing, and, as was often the case, an aisle was added – the present South Aisle. The extent of this addition is clearly marked by the continuous string-course under the windows. Hitherto the villagers had worshipped in a small building of carr-stone, dark in colour and rude in workmanship. But the new addition was to have pillars and shafts and quoins and mouldings of white stone from Barnack near Peterborough, and the stone was to be beautifully worked. There was the new entrance doorway with its rich, deep mouldings. There were the pillars, and the shafts and hood -moulds of the windows, just as we have them to-day. And there were the windows - now, alas, removed - which were doubtless somewhat similar to those in the lowest stage of the tower of St. Nicholas, a stage erected about 1200 to 1210. Our own south aisle is undoubtedly later than this. It may be dated approximately between 1220 and 1240, and belongs to the ‘Early English’ period. 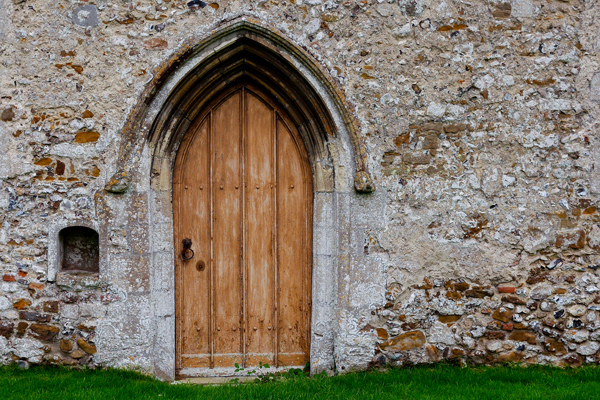 The doorway is remarkably similar to that in the west front of Binham Abbey - a doorway which like ours shows tooth ornament with only two ‘leaves’ instead of four, and is known to have been erected between 1226 and 1244. Above the outer entrance to the South porch is a niche which would have contained a statue of St Botolph. On the south wall there is an interesting Consecration Cross painted in red and black. 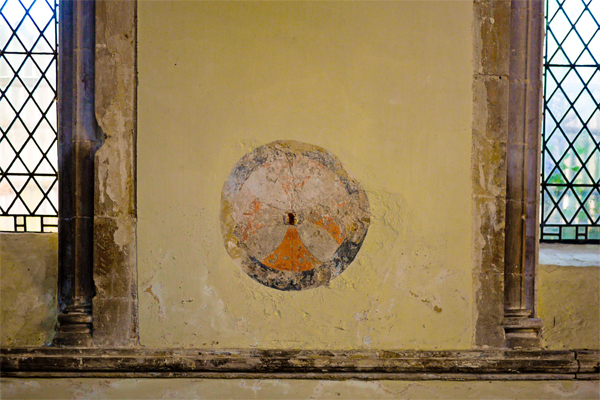 Such crosses were placed on the wall to mark the spots anointed by the Bishop when the whole fabric or part of it was dedicated. On the outside of the same wall we find fragments of Roman brick - made over 1,600 years ago. These were obtained from the remains of the Roman Villa which stood in the meadow a few hundred yards from the foot of Church Hill. They must have been made before the year when the Roman power in Britain came to an end, that is before the year 410. The font seems to be of the same period as the South Aisle. Like many fonts of the 13th century it is supported by five circular shafts. The capitals of these shafts agree closely with those of the adjacent pillars in the south arcade. The North aisle is later than the South Aisle and was built in the late 1200's. The North doorway has some very weathered headstops and adjacent to the North door there is a holy water Stoup. With the consecrated water placed therein the people signed themselves by using a wetted finger to make a cross on their foreheads, as they entered God’s House, praying that they might be accepted as pure in the sight of the Almighty. The windows, however, like those of the South aisle, are later insertions, and belong to the Perpendicular period. If we may judge by the hood-moulds the original windows consisted of three lancet lights. There are no shafts to either windows or door. The termination of the hood-moulds is the well-known ‘buckle’. We come next to an enlargement far more important and far more beautiful, an enlargement which must be associated with the names of Sir Benedict de Breccles and his wife Alice. This consisted in the lengthening of the Nave by one bay, and the erection of the present chancel and trancepts. The work was carried out in the ‘Decorated Period’, a period described as ‘one of the great glories of our country’s art’. The windows are noteworthy because of the beauty of their tracery and the variety in their designs. The window in the North Transept is wonderfully attractive in its simplicity; but its companion in the South Transept is usually more admired. In the chancel two windows have ‘Kentish tracery’. This form of window is ‘usually later than 1315’ We must note that the tracery in the East Window is modern — but none the less beautiful. 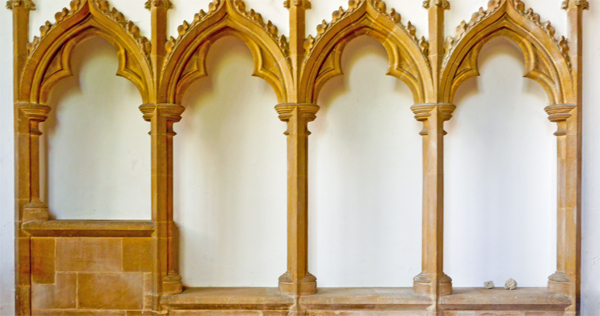 The niches on either side of the East window are richly canopied, and show the ‘ogee arch’, a form which only came into general use after 1315. Before the Reformation each niche had doubtless a statue, one of St. Botolph, the other of St. Mary. The Piscina and Sedilia, also richly canopied, show other examples of the ‘ogee arch’. The channel in the basin of the piscina carried away the water in which the priest washed his hands, and the sedilia provided seats for those who ministered at the altar — the celebrant, deacon, and sub-deacon. There is a piscina in the south transept, good evidence that an altar formerly stood near. The work just described cannot be later than 1349, the terrible year of the Black Death. But, as we have seen, we shall be justified in placing it in the period after 1315. Most probably, however, the work was carried out between 1320 and 1335, when Edmund de Breccles was Rector, and when the Manor House was occupied by Sir Benedict de Breccles, or by his widow and son. It was about the year 1316 that Sir Benedict, who is described by Blomefield as ‘a very wealthy and influential man’, became Lord of the Manor. We hear of him in various ways until about 1327, when he seems to have died. Later, in 1335, when a new Rector was appointed, the nomination was made by Sir Benedict’s widow, for the son and heir was a minor. Two years later, when another appointment was made, the widow also was dead, and the heir being still a minor the nomination was made by his guardian, Alexander Falstolff. We cannot but see here a moving story — a happy marriage, the birth of a son, the early death of the father, the death of the widow before the son became of age, and in the midst the erection of our chancel and transepts, followed by the erection of a beautiful tomb in memory of Sir Benedict, a tomb destroyed by iconoclasts in the year 1619. As the tomb was a memorial of Sir Benedict only, we may be sure it was the work of his widow, and was erected in her lifetime. Our churches consisted in the earliest days of two parts, a nave for the accommodation of the faithful, and a sanctuary for the accommodation of the altar. The mark of division was the chancel arch, and the underlying thought was that of deep reverence. But in the middle ages, owing to the popular devotions which came into being, there was an increase in the number of altars, and at the same time an increase in the number of chapels to receive them and chaplains to serve them. When our transepts were erected the object was to provide worthily for two additional altars; and when the chancel was designed nearly fifty feet long the purpose was to give space for the stalls of chaplains and for the ceremonies of such days as Good Friday and Easter Day. One of the most important of these ceremonies was connected with the Easter Sepulchre. In churches where no such sepulchre existed an altar tomb on the north side of the chancel was sometimes used. This was perhaps the case at Grimston, for the tomb of Sir Benedict de Breccles was probably just what was needed. If we may judge by what took place elsewhere, every year, early on the morning of Easter Day, the Blessed Sacrament was taken with great ceremony from the sepulchre, and while an anthem was sung was brought to the High Altar. Afterwards, under a rich canopy, and surrounded by ‘great store of lights’, it was carried in procession round about the church ‘all singing, rejoicing, and praising God’. And so it was brought again to the High Altar, there to remain until Ascension Day. It was doubtless on occasions like this that the Rood-loft was lighted with scores of lights. Perhaps singers were stationed there high above the congregation. In any case access to the loft was possible by means of a staircase behind the north pillar of the chancel arch; signs of the staircase are still to be seen. The loft received its name because it bore the ‘rood’ — the crucifix. It also bore the figures of St. Mary and St. John standing at the foot of the cross. The 15th century Rood screen is richly carved and painted on its diapered panels on the lower half, with designs based on Italian silk fabrics of the period. 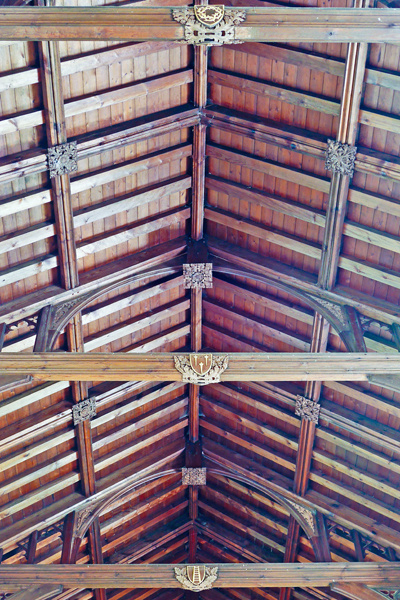 The top, though, is Victorian work to retore its medieval appearance. In addition to the Chancel and Transepts this period gave us the porch. In olden days the porch had far greater importance than to-day. It was in the porch that the Churching Service took place, and the beginning of the office of Holy Baptism. 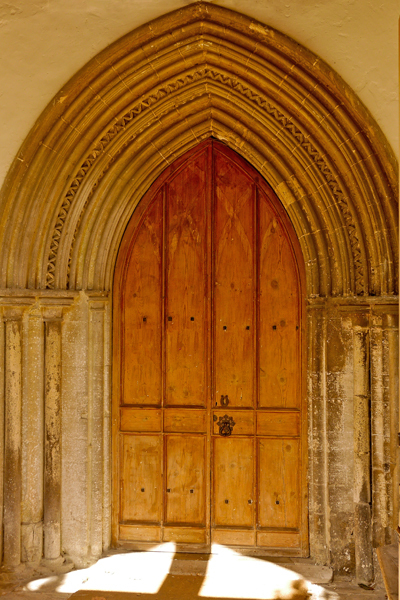 It was in the porch that the Marriage Service proper took place — the old phrase was ‘marriage at the church door’. It was in the porch that after the marriage ceremony the bridegroom presented the bride with her dowry. Under Cromwell's disestablishment of the Church, weddings tookn place here from 1653-1660, conducted by Justices of the Peace. Our register shows that John Harvie & Thomasine Ives were the first couple to be married under the new system on St Valentine's Day 1653. But the reforms emanated from faraway London, and there was a bit of a muddle to begin with, so the couple had to come back and be married again a month later. It appears the Banns were not called properly the first time. Sometimes the porch was the meeting place of guilds and societies, and there is at least one instance where meetings for public business are still held in the porch. The seats provided and the notices exhibited to-day are neither more nor less than survivals from the customs of the past. It was left for the 15th century to crown the work by adding a clerestory to the Nave and erecting the tower. Seen from the Gayton Road on a bright morning the tower has rare attractiveness. Simple, dignified, and graceful, a structure of two stages, faced with flints, and capped by an enriched battlement and four slender pinnacles, it rises by virtue of its 91 feet far above the surrounding trees. A west doorway with many orders of mouldings, a large 3-light West window and four big 3-light belfry windows. Both Tower and Clerestory are good examples of the work of the ‘Perpendicular’ period. It is interesting to note the way in which the work was carried out. To give space for the clerestory the sides of the roof were raised, and at the same time the ridge was lowered. The transepts were dealt with similarly, witness the two kinds of work, one of flint, and one of carr stone. In order to sustain the west walls of the transepts an arch was erected at the east end of each aisle, and for the sake of harmony windows were inserted in the aisles like those in the clerestory. As for the chancel, not only was the ridge lowered and the roof made almost flat, but the east window was reduced in height and its tracery assimilated to that of the Perpendicular period. At a subsequent date screens were erected to separate the chapels from the aisles. We have good evidence of this in the mutilated figures and the patched-up pillars where the aisles meet the transepts. Every guild wherever located, laid stress on the principle of brotherly love and charity, and no guild was without its religious observances. The members were drawn from all classes. They were bound to help one another in life and in death. On the day of the patron saint all attended mass. They attended the funeral of every member, and on the following Sunday they attended church. The larger guilds had chaplains of their own, and every guild had its officers and its annual feast. There can be little doubt that some of our Grimston guilds were able to support a chaplain, and in consequence we find in our church stalls for several priests. The six stalls adjacent to the chancel screen are interesting on this account. 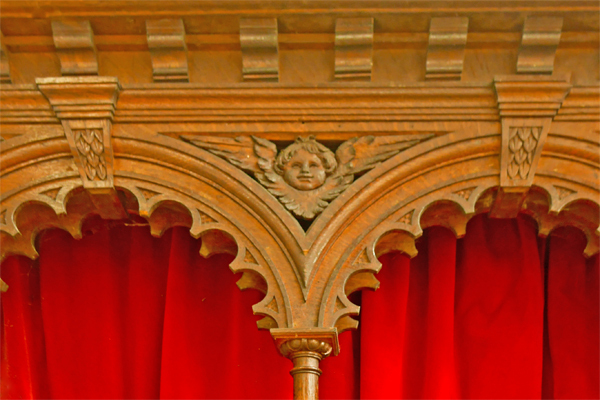 But they are interesting also as examples of 15th century woodwork and for the carvings on the movable seats misereres as they are sometimes called. The bracket attached to the lower side of these seats was used as a secondary seat. It was provided for the relief of the infirm. Note the ornament called the Tudor flower. Note also that one of the carvings is a portrait and very striking in character. 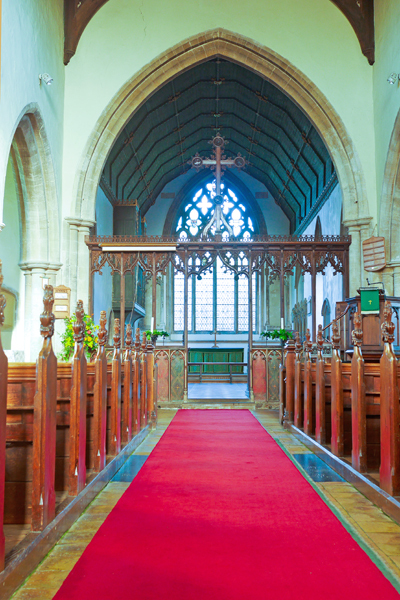 It was not until the 15th century that fixed seats for the congregation became common. Throughout the Middle Ages the people at worship knelt or stood, as they often do still in churches abroad. Yet for the aged and infirm one or two benches were provided. Perhaps the bench ends near the font represent the earliest seats set up in our church. They seem to belong to the 15th century, and among them there are some quaint specimens of carving — a man in the stocks, for example, and a fox and goose. See photo's of the carvings on Grimstons' Medieval Carvings page. As thus completed more than 400 years ago, the church was substantially what it is to-day. Its length was nearly 130 feet, and its width at the transepts over 60. But in one respect the interior was very different from what it is now, for it was bright with colour. There were three altars, all richly adorned. There were three screens, all decked with colour. In the transepts there were wall paintings. In the niches there were painted statues. There was colour even on the pillars. Among the remnants of this ancient colouring the best is seen to-day on the lower part of the chancel screen. But there are traces also on some of the pillars, and in each transept there are signs of the wall-paintings. We cannot but ask what took place in our church at the Reformation. The answer is both interesting and illuminating. The chapels lost their altars and screens; the rood was removed, and with it the attendant figures; the niches and sedilia were mutilated and covered up. Such at any rate are the inferences to be drawn from the facts as we know them. But the most interesting stories are those of the wall-paintings and the tomb of Sir Benedict de Breccles. If we examine the wall of the south transept we shall find remnants of a picture of the Crucifixion, and fragments of texts. One of these texts was the 14th verse of the 19th Psalm ‘Let the words of my mouth, and the meditation of my heart, be acceptable in thy sight, 0 Lord, my strength, and my redeemer’. The words ‘in thy syght’, followed after an interval by the words ‘and my redemer’, are just readable; and so is the number of the verse. We have here a striking illustration of events which took place between 1547 and 1554. In the former year an order was issued that all wall-paintings should be destroyed. This was obviously carried out — but in an imperfect manner. At a later date in the same reign — that of Edward VI - a further order was issued requiring texts to be painted where the pictures formerly stood. Still later, in the year 1554, when Queen Mary had come to the throne, a command came that the texts should be obliterated. Thus it came about that in 1895, when the outer coats of whitewash were removed, portions of both paintings and texts were revealed. And now as to the fate of the tomb of Sir Benedict de Breccles. This tomb was destroyed during the year 1619. The act was that of private individuals, and was doubtless due to anti-popish zeal. We may be sure, therefore, that the tomb was of real importance. On the 5th of October, 1619, the Rector, himself a strong Puritan, held an enquiry in the matter, and it was decided that ‘diligent search should be made after those who had been guilty of a most flagrant crime and act, in throwing down the tomb of Sir Benedict de Breccles, Knt., here buried in this church’. The loss was irreparable, and our church permanently the poorer. If we may accept the evidence of a tablet built into the north wall of the vestry, the predecessor of the present vestry was erected in 1631. From the cover of the oldest register we get the following note: ‘The Church was whited and adorned in the yeare of our Lord and the Kynges Armes new put up in the yeare aforesaid 1640. John Harvie and Thomas Rothwell, churchwardens’. The omission of the date in the first sentence is amply atoned for in the second. As depicted by Ladbrooke in ‘Norfolk Churches’ the roofs of both nave and chancel were nearly flat. Moreover, the east window was shorter than now and had Perpendicular tracery, while the south-west window of the chancel was blocked up. It seems indeed that in the early days of the 19th century the fabric was greatly in need of restoration, and it is good to know that a beginning was soon made. In 1814, the year before Waterloo, the tower-roof was re-covered with lead, W. Lofty and R. Matthews being then churchwardens. In 1832 the church was re-roofed and the windows re-glazed : and in 1845 the present seats were installed instead of the old pews. A few years later — in 1856 — the vestry was rebuilt. Its predecessor was ‘an old unsightly red-brick cottage, with a red-brick chimney, pantile roof, and a horridly dilapidated brick floor’. Up to the year 1830 this building had been used both as vestry and a Puritan school. Oliver Cromwell himself visited Grimston, staying with Colonel Waller, who lived at the moated manor house, before it was enlarged in 1855 as a Rectory. (in Massingham Road but now a private residence.) Beyond the vestry you can find an unusual memorial, a Victorian iron cot, sadly commemorating a young child. 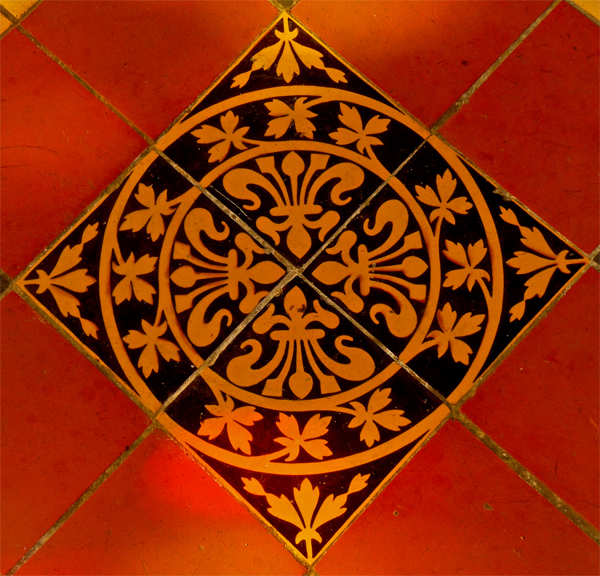 In 1870 the chancel was partially restored and the present tiles laid down. But there was much yet to be done, for in 1888 the chancel had a low ceiling, its east window was shortened, and its walls covered with whitewash. It was under these circumstances that the Rev. J. Fowler began his great work, a work of restoration and enrichment carried out under the direction of Messrs Bodley and Garner, chiefly in the years 1889, 1890, and 1895. Rector John Fowler's wife Martha was a sister of the architect G F Bodley, a pupil of George Gilbert Scott. John and Martha paid for this restoration in memory of Thomas Bodley and also built what is now the village Hall as a club house for labourers to occupy their winter evenings soberly.In the first period the restoration of the chancel was undertaken. Here the roof was raised to its original pitch; the windows, niches, and sedilia were restored; and the walls and ceiling decorated. In the latter period, the nave was re-roofed, and the windows were re-leaded and re-glazed. Moreover the church was enriched by the provision of the upper part of the chancel screen, the equally beautiful font cover, and the excellent organ. Originally the Chancel was highly coloured and there was a large fresco over the Chancel arch but these were whitewashed over in the 1960's. There is a tablet in memory of Mr. Thomas Bodley near the tower arch; and the generous Rector who did so much for the church is commemorated by the lectern. ‘He, being dead, yet speaketh’. The shields on the nave roof are the emblems of the crucifixion of Jesus (whip,nails, ladder, crown of thorns, bag of silver and five wounds to his hands, feet and side. The IHS badges represent the Greek form of the name Jesus. At the beginning of the above description an earlier church was referred to. What was that church ? This is exactly our case. There was an early nave to which, as we have seen, first a south aisle was added and then a north aisle. Of this nave a part of one angle remains and is still to be seen. It consists of several large pieces of carr-stone, rudely worked, in the west wall of the north aisle near the north-east corner of the tower. These stones are obviously the quoins of an earlier nave. Three things seem quite clear : (1) The church to which the quoins belonged was early Saxon; (2) it was erected of stone; (3) the stone was carr-stone, quarried but a few miles away — probably at the delph near Warren Farm. But there is evidence, I think, which carries us further. The pillar in front of the pulpit has a capital like those in the chancel arch, and unlike its companions in the south arcade. The inference is that before the 14th century the nave had four bays only, and represented the Saxon nave. The only other explanation possible — the fall of a central tower — has in our case nothing to recommend it. But if there was a Saxon church why is it not mentioned in Domesday Book ? The answer is that only those churches were mentioned which had glebe. In this neighbourhood the Domesday Survey mentions churches at Appleton and Congham, at Flitcham and Gaytonthorpe and East Walton; but there is no mention of a church at Castle Rising or Dersingham, at Gayton or Middleton or Massingham. All the churches named, except Congham, had glebe; and we may be sure that Congham was not really an exception. It was impossible for the Bishop to bequeath the land as we can to-day. All he could do was to bequeath the rights he enjoyed. Other people had rights in the same land, and obviously some of the Bishop’s rights extended to only part of the year — the lands were perhaps half-year lands. Our church has the distinction of being dedicated to an English saint, St. Botolph. 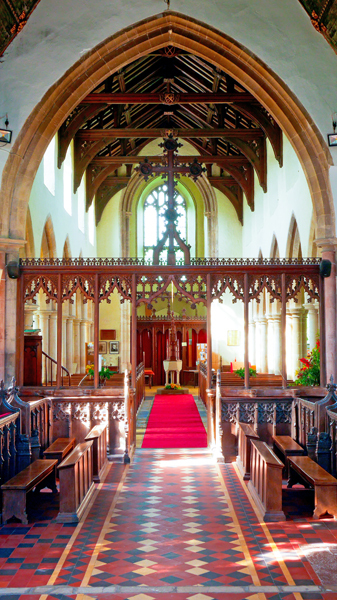 Norfolk has over ten such churches, and in the whole country there are more than sixty. Who then was St. Botolph ? He was one of two brothers, Botwulf and Adwulf, who were born in England about the beginning of the 7th century. The two brothers were sent for instruction and training to a Benedictine monastery on the continent. On his return to England Botwulf founded a monastery in 654 at Icanho ( near Aldeborough), but is remembered best at the place now called Boston — Botwulf’s ton. There he laboured for the rest of his life, a quarter of a century, training men as he had himself been trained, and sending forth a continual stream of Christian teachers. His fame for piety and learning spread throughout the land. Men visited his foundation to learn about the way of life lie taught, and to see the saint himself. He was spoken of as ‘unique in life and teaching’, and when he died about the year 680 the country was greatly the poorer. His day is kept on June 17th. But why was our church dedicated to this saint ? In his honour, of course, and on account of his singular piety and godliness. But perhaps there was a further reason. Boston is not far away, and some of St. Botolph’s disciples may have been the evangelists who first brought the gospel message to Grimston. Perhaps the saint himself may have laboured in our parish. We do not know. Yet there can be little doubt that the ‘pond’ was used for the first baptisms, and the site of the church immediately opposite may well represent the place of the earliest preachings. There is an early reference to Grimston and St. Botolph’s day which may well be mentioned at this point. On the 20th of October in the year 1254, Henry III was at Bordeaux in France, and signed there a charter by which he granted a yearly fair to ‘Walter de Thorpe, parson of the church at Grimston, co. Norfolk’. This fair was to be held at Grimston, ‘on the eve, the day, and the morrow of St. Botolph’, that is, on the 16th, 17th, and 18th of June every year. June 17th was a great day in the parish. It was one of the chief holidays of the year, and the day was begun by the gathering together of a great congregation in the Parish Church to celebrate the Holy Eucharist. Before another century had passed, this was all changed. The ‘Great Pillage’ had taken place, and banners, hangings, crucifixes, candlesticks, and vessels had well nigh all disappeared. An enquiry was made in 1569 whether the Holy Communion was administered ‘in a decent communion cuppe provided and kept for the same purpose only’, and many cups and patens still in use were provided in consequence and bear the date 1569. Next in antiquity are two flagons and a ‘silver salver’ — a large paten — all mentioned in an inventory dated 1709, and made about that date. The flagons are inscribed ‘This given to the Church of Grimston in Northfolk’, and the paten has the same inscription except that Norfolk is substituted for Northfolk. A small paten inscribed ‘Given to Grimston Parish Church, 1716’ has the year-mark 1715. The tower arch is very tall and graceful, 15th century like the tower. But notice the remains of an earlier arch which must have been removed when a larger tower was built. The tower arch screen is Victorian in an imitation of a Jacobean style, surplus from a London Church, where it had been given in memory of the man who developed gunpowder. The tower used to have a gallery, where the parish band played before Victorian fashions removed music making to the chancel. a blocked up doorway from the staircase is just visible. Two inventories, the first dated 1709 and the second dated 1763, throw a flood of light on the history of the bells. The number of bells in 1709 was four, and the weights were, then believed to be 6 cwts. 3 qrs., 9 cwts., 12 cwts. 3 qrs., and 19 cwts. In 1763 the number was five, and the approximate weights were 4 cwts. 2 qrs., 6 cwts. 3 qrs., 9 cwts. 1 qr., 12 cwts., and 15 cwts. A note in the inventory says the bells were ‘made to this weight in 1753’. There seems little doubt that the old tenor — with perhaps a little weight from its neighbour — provided material for the new treble and new tenor. 1. These bells were cast in the year 1816. 2. The Rev. J. Brett, rector, Robert Matthews and William Lofty, churchwardens. 3. William Dobson, founder, anno domini 1816. 4. William Dobson, Downham, Norfolk, 1816. 5. Fear God and honour the King. 6. Give no offence to the Church. The weights are approximately 4 cwts., 4½ cwts., 5 cwts., 5½ cwts., 7 cwts., and 9 cwts. It seems indeed that the bells were entirely re-cast, and their weights considerably reduced. These fine toned bells were cast by William Osborn of Downham Market in 1816 and re-hung in 1979 with a concrete ring-beam below the belfry window. Read about our Bell Ringers here. You can also hear the 18th century clock ticking, powered by its large stone weight. The chiming mechanism was not replaced when the bells were re-hung but you can see the second hole where the weight hung. 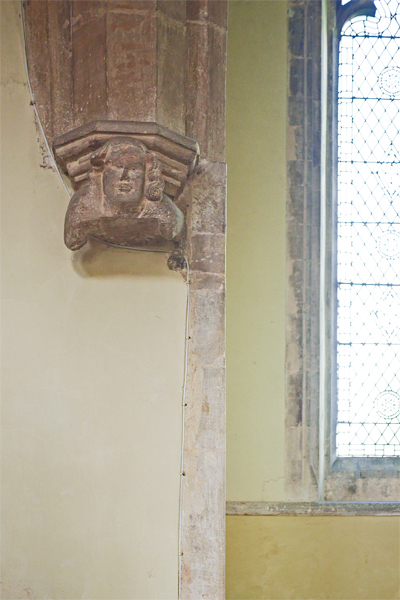 Seen in the North Aisle, the bell is from the old St Luke's Chapel that existed in Pott Row.